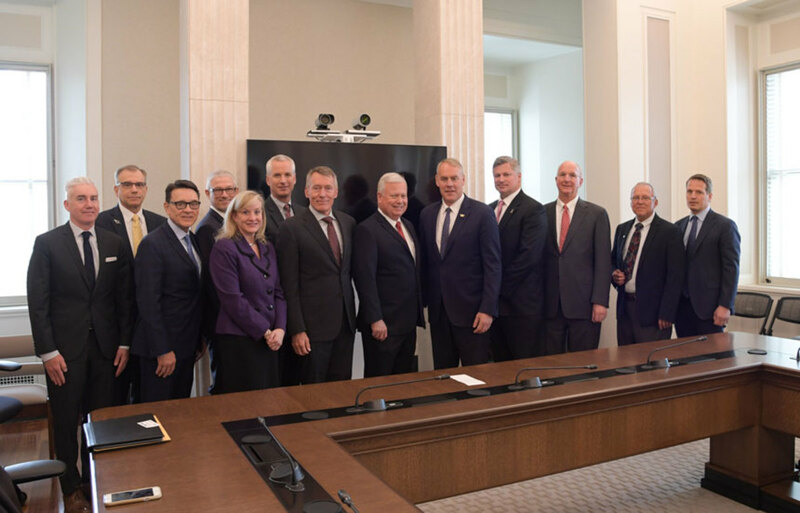 The Outdoor Recreational Roundtable made its formal launch last week with Department of the Interior Secretary Ryan Zinke (fifth from the right), members of the recreational marine industry, and bipartisan members of Congress. Congressional and administration officials joined recreation industry leaders on Thursday to mark the formal launch of the nation’s coalition of outdoor recreation trade associations, the Outdoor Recreation Roundtable. The meeting with a bipartisan group of lawmakers included seven members of Congress, and the unveiling of a new website that will serve as a resource to learn more about the industry’s economic impact, the coalition’s membership and the latest outdoor recreation news from across the country. Outdoor recreation leaders met with Department of the Interior Secretary Ryan Zinke to discuss the role of the department’s new Outdoor Recreation Advisory Committee, which will serve as a collaborative panel to facilitate public-private partnerships designed to improve public lands and waters. Recreational marine industry leaders in attendance included representatives from the American Sportfishing Association, BoatUS, the Marine Retailers Association of the Americas, and the National Marine Manufacturers Association. Discussions with the secretary also included ways that the department, which manages more than 25 percent of the American landscape, can elevate outdoor recreation as a federal priority. With attendance on public lands and waters dwindling and facilities aging, ORR wants the administration to focus on creating an enjoyable experience by enhancing amenities from WiFi availability to refurbished marinas. The outdoor recreation industry’s annual gross output is projected to be $673 billion, surpassing other sectors such as agriculture, petroleum and coal, and computer and electronic products, according to new data by the Commerce Department’s Bureau of Economic Analysis. This was the first time the BEA, the government agency responsible for reporting U.S. GDP, included the outdoor recreation industry in its calculations. The bureau also found that outdoor recreation makes up 2 percent of the country’s GDP, and has increased an average of 4.4 percent since 2012 — significantly greater than the 3.6 percent average increase in the overall GDP. “America’s outdoor recreation industry is finally being recognized by national leaders for its importance to the health of the U.S. economy, and the Outdoor Recreation Roundtable is going to play a major role in advocating for policies that ensure we can continue being a driving economic force,” said ORR vice chair and Recreational Vehicle Industry Association president Frank Hugelmeyer. The roundtable’s agenda includes fostering collaboration between the outdoor recreation industry and federal policy makers and removing barriers that prevent improvement and maintenance of public lands through public-private partnerships. It also includes prioritizing accessibility of public lands, advancing balanced policies that conserve public lands and waterways so that they can be accessed and enjoyed today and by future generations of Americans, and ensuring that the outdoor recreation economy is recognized by policymakers for its importance to the health of the overall economy.